SB 11.5.21, Translation: In Satya-yuga the Lord is white and four-armed, has matted locks and wears a garment of tree bark. He carries a black deerskin, a sacred thread, prayer beads and the rod and waterpot of a brahmacārī. SB 11.5.23, Translation: In Satya-yuga the Lord is glorified by the names Haṁsa, Suparṇa, Vaikuṇṭha, Dharma, Yogeśvara, Amala, Īśvara, Puruṣa, Avyakta and Paramātmā. SB 11.5.24, Translation: In Tretā-yuga the Lord appears with a red complexion. 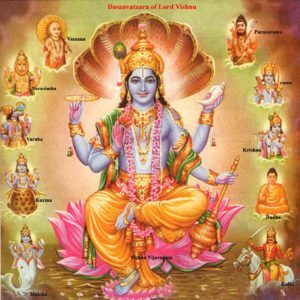 He has four arms, golden hair, and wears a triple belt representing initiation into each of the three Vedas. Embodying the knowledge of worship by sacrificial performance, which is contained in the Ṛg, Sāma and Yajur Vedas, His symbols are the ladle, spoon and other implements of sacrifice. SB 11.5.26, Translation: In Tretā-yuga the Lord is glorified by the names Viṣṇu, Yajña, Pṛśnigarbha, Sarvadeva, Urukrama, Vṛṣākapi, Jayanta and Urugāya. SB 11.5.27, Translation: In Dvāpara-yuga the Supreme Personality of Godhead appears with a dark blue complexion, wearing yellow garments. The Lord’s transcendental body is marked in this incarnation with Śrīvatsa and other distinctive ornaments, and He manifests His personal weapons. SB 11.5.32, Translation: In the age of Kali, intelligent persons perform congregational chanting to worship the incarnation of Godhead who constantly sings the names of Kṛṣṇa. Although His complexion is not blackish, He is Kṛṣṇa Himself. He is accompanied by His associates, servants, weapons and confidential companions. This is just a hint. Much more in Isvara Archive.